Kellar Radio Talent Institute™, Appalachian State University, Boone, NC. Kentucky Broadcasters Association WKU Radio Talent Institute, Western Kentucky University, Bowling Green, KY.
Confer Radio Talent Institute, Bloomsburg University, Bloomsburg PA.
Georgia Association of Broadcasters Radio Talent Institute, Grady College and The University of Georgia, Athens GA.
Hubbard Radio Talent Institute, Central Washington University, Ellensburg, WA. Missouri Broadcasters Association Radio Talent Institute, Northwest Missouri State University, Maryville, MO. Tennessee Association of Broadcasters Radio Talent Institute, University of Tennessee, Knoxville, Knoxville, TN. Beasley Radio Talent Institute, Emerson College, Boston, MA. Other Radio Talent Intitutes coming on line soon. This is the only program of its kind in the world. Each university’s Radio Talent Institute™ will have its own website and URL, and each is connected to the National Radio Talent System™, which gives radio stations more talent to choose from when looking to hire, and to give each student/young broadcaster the opportunity to showcase his/her talents and resume to more radio stations and opportunities, not just in their region, but all across America. The first Radio Talent Institute™ was on the campus of Appalachian State University in Boone, NC and is in its eleventh year. We are in conversation with other universities now as they begin their first Radio Talent Institute™ in their region of the country. 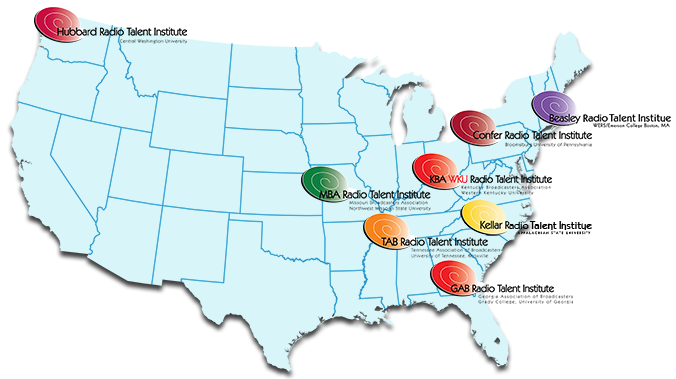 If there is a university you would like to see establish a Radio Talent Institute™, please contact us and we will pursue it with them.